AVOID THE LINES ON RACE DAY!! If you are one of the first 3000 pre-registered participants, HERE ARE THE TIMES to pick up your souvenirs and bibs! YOU CAN STILL REGISTER FOR THE RUN at these locations and times if you haven't already. 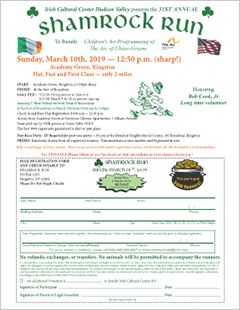 Print out and complete the registration form to save time, but we'll also have forms available. This is for individuals and groups/teams (NOT school teams). Saturday March 9th, 2pm-6pm, at the Kingston Kilt Fest, Tony's Pizzeria, 582 Broadway, Kingston, NY. (THIS is where you can buy a Kilt to help break the Guinness World Record Kilt Race!). Sunday 10am-12:30pm at the Governor Clinton, 1 Broadway, Kingston, NY. And a big thanks to Ryan & Ryan Insurance for all they do to help make this happen!